He was born in Vienna, Austria, on February 20, 1844. Vienna was called the Paris of Eastern Europe during the time Boltzmann was growing up. It was the cultural center for opera, dance, and classical music, and he enjoyed them all. He received his doctorate from the University of Vienna in 1866, and then taught mathematics and physics at Vienna and Graz, in Austria, and Munich and Leipzig, in Germany, for the next 40 years. Unlike many other scientists of his time, Boltzmann was convinced that everything is made of atoms. He believed that the heat in any object was a form of motion, the motion of the atoms in that object. For example, a cup of cocoa feels hot because its atoms move faster than the atoms in our fingertips. As the minutes pass the cocoa always cools until it reaches the same temperature as the room and all the atoms have the same average speed. Critics of the atomic theory asked how it is that the atoms in the cocoa “know” how to slow down over time. Boltzmann’s brilliant solution was to apply the laws of probability and statistics. It could happen that the atoms in the cocoa pull energy from the surrounding air, moving faster and growing warmer by themselves, but because of the great number of atoms in the cup, that outcome is overwhelmingly unlikely. 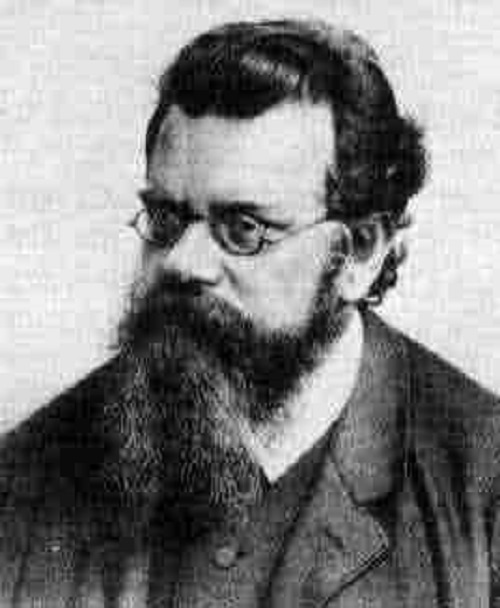 Boltzmann found that the cocoa cools because hot objects are simply more likely to cool than to grow warmer. The Second Law of Thermodynamics, dearly laid out by RUDOLF CLASIUS when Boltzmann was just a boy, suggested that heat flow seemed to have a preferred direction over time. That law also said that the entropy, or disorder, of a system of objects always increases with time. In an 1875 paper Boltzmann demonstrated that disorder is more likely because there are so many more ways it can happen. Boltzmann was the first to explain the Second Law using statistical methods that came to be known as statistical mechanics. He showed that the Second Law was unique among all the laws of physics as it is based on laws of chance. Later Boltzmann worked with the British physicist JAMES CLERK MAXWELL to further develop the techniques of statistical mechanics. With his former teacher Josef Stefan, he also developed the formula describing the rate of heat production of a hot object, such as the filament of a light bulb, or the surface of a star. He published his results on thermal radiation in 1889. Troubled by bouts of depression, bothered by other scientists’ criticisms of his work, suffering from asthma, angina, severe headaches, and very poor eyesight, Boltzmann hanged himself in his hotel room on September 5, 1906, while on vacation in Duino, Italy. Boltzmann’s statistical mechanics helped to add credibility to atomic theory and formed the theoretical basis that eventually led scientists to develop quantum theory. His support of Maxwell, along with that of his many students, led to other significant achievements in physics in the first half of the twentieth century. Boltzmann’s statistical mechanics worked so well that most scientists came to accept the atomic theory by the end of the nineteenth century. ALBERT EINSTEIN used Boltzmann’s methods in his 1905 paper on molecular motion that finally settled the issue and proved that atoms must exist. Although Boltzmann was critical of many lesser scientists, he praised Maxwell and was probably the first scientist outside of England to recognize the importance of Maxwell’s new theories of electromagnetism. His interest and unfailing support spread Maxwell’s influence throughout Europe. Einstein later recognized the importance of Maxwell’s work and used it, in turn, as a foundation of his 1905 theory of relativity. Ironically, one of Boltzmann’s greatest legacies came through a contemporary who strongly disliked him. MAX PLANCK, the great German scientist, was reluctant to use Boltzmann’s statistical approach but found it the only way to solve a stubborn problem about the nature of light. That led to the development of quantum theory, the most important advance in physics in the twentieth century. Boltzmann was a brilliant but demanding teacher and many of Europe’s finest young scientists came to work with him. He cared deeply about his students and gave them extraordinary attention. One of his students, SVANTE ARRHENIUS, went on to develop the modern theory of acids and bases. His brightest but shyest pupil was LISE MEITNER, who discovered and named the process of nuclear fission, the key to nuclear power plants and bombs.